I am not your typical person that believes everything at face value. I have always believed that there was more to life than what was being taught at home and school. It would take me years to figure out that we have been duped by an education system that was being controlled by big business. The story we were once told of going to school to get a good education so that we could get a good job may have been the American way 50 years ago, but it’s been replaced by corporate greed. You see, corporations only care about one thing and that’s the profits they pay their shareholders at the end of the year. Gone are the days of going to school, getting a good education, and working for the same company for 40 years. That’s called the 40-40-40 Plan where you work for 40 hours a week for 40 years to retire with 40 percent of your income. Most of us can’t survive off 100% of our income, and now some of us that were ready for retirement are forced to continue to work. We have been downsized, outsourced, replaced by automation, and outright terminated because we now live in a global economy and U.S. employers are no longer bound to hire U.S. workers when they can get the same services overseas for half to a quarter of the price they would pay U.S. workers. 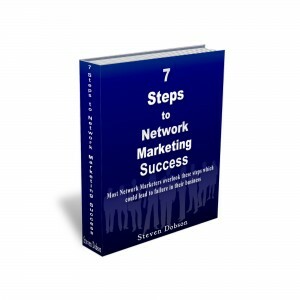 I was introduced to Network Marketing in the late 1980’s, but because I had a security net in the form of a job, I did not have the proper motivation to become successful in this industry. When I did decide to give it my best, I was still not focused enough to make the best of what was in front of me. I had not determined what I was in this industry to achieve so my actions were not those of a successful person. Years later and thousands of dollars wasted on “Get Rich Quick” opportunities, I decided to educate myself on what it took to become successful, and along that path of self development, I discovered my “WHY”, and once I did that, doors of opportunity that were once closed began to open, and areas once believed I could not master, now seemed like elementary school subjects. I say all this to say, “You should never let the fate of you and your family be controlled by another person.” Step out of your comfort zone and become the person that you dream of being. Trading your time for money is not going to give you the satisfaction or the income that you deserve. The Network Marketing and Direct Sales Industry will give you the time freedom that you’re looking for and if you find the right coach, mentor or trainer you can cut years off your learning curve and start making the type of money that you deserve. Download my “7 Steps to Network Marketing Success Mini Course” and take the ‘Are You Coachable” quiz to determine if you are a good coaching candidate and have what it takes to make it in this industry. It will also help us determine if we would be a good fit in a coach-client relationship and comfortable working together. Visit my blog often and browse through the posts and articles, connect with me on Twitter, and befriend me on Facebook and YouTube, and let’s uplift and empower one another along this journey in life.